Friday list once again not too exciting… taxes at the Southwest harbor library in a “mixed” storm. Sigh. Wednesday’s blizzard turned out to be just very light snow with howling wind where I live. A plus! Another plus? the boss closed the office based on the forecast (which was the right thing to do , as we were supposed to get 6-8 inches of snow). They did get tons more Down East, but you just can’t trust the National Weather Service sometimes. He will probably never close again. Make sup for the day a few weeks ago when he should have closed and didn’t, I guess. Anyway – A took the day half off as well, so it was fun. Felt like a Sunday. Which made Thursday feel like a Monday. Ugh. And it was tax day in Ellsworth. Only three more weeks… then life returns to something like normal. Well, there is basketball. Amazingly, I picked a lot of the right upsets on the men’s bracket, but… I picked Kansas to go all the way, and now they are done. Oops. Still in good shape on the women’s brackets, and loving all the games. Plenty of snow in the yard, still, but mostly melted in deck and porches. Of course we shoveled it off a lot this winter. But still – bare space is wonderful. Did a little shopping at AC Moore while I was in town, got some Spellbinders dies on special, some sock yarn, and some beading supplies – a little bit of everything! Today is a dull day, even though it is gorgeous out – cleaned the bathroom, worked on figuring out a really poorly written knitting pattern, for wrist warmers, of all things! I’ll get photos of them eventually. Right now I am mad at them. Made pizza for “lupper” and really, haven’t done much else… but I need to get up to the craft room to make a birthday card soon. Here it is, folks. Yawn. Hit the road at 6:30 AM for beautiful Stonington, Maine. Spend the day doing tax returns. Finish up there around 5. Get home around 6:30 PM. If I haven’t already done it, knit a round on stargazing socks. I’ll do better in a couple of weeks, I promise. I cleaned off the camera again! 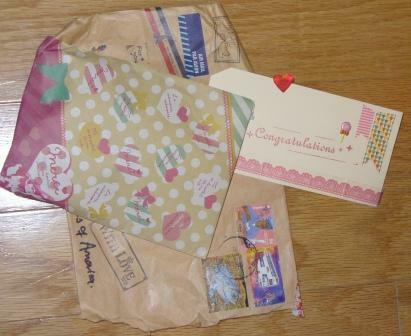 It actually has WIP photos, and more exciting, photos of my mail today! I had a notice for a package earlier this week, so stopped to get it today. Surprise – there were 2! Both were giveaways from wonderful blogs I enjoy. What a great day! 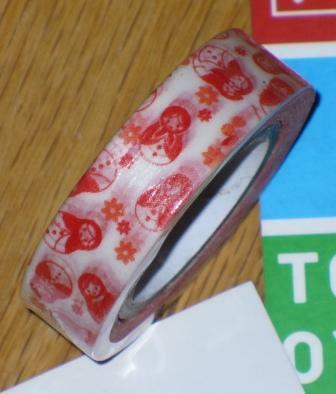 Angela from Pretty Little Things in a Box sent a package of postcards, washi tape and an adorable stamp all the way from Singapore! 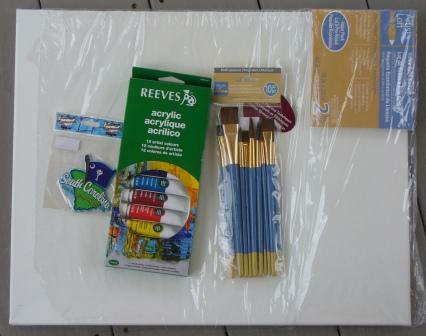 And Denise from the Wonder of Yarrow House sent me a canvas, a set of acrylic artist paints and a pack of brushes. Can you believe it? A whole artist starter set. Plus, she added to my refrigerator magnet collection! I always pick up a magnet from places I visit, and we are going to So Carolina in a MONTH. 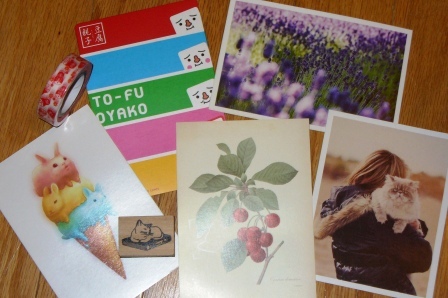 She sent magnet from there, so I already have my souvenir. These ladies have sent me great tools to have lots of creative fun, and I can’t wait to start messing around! 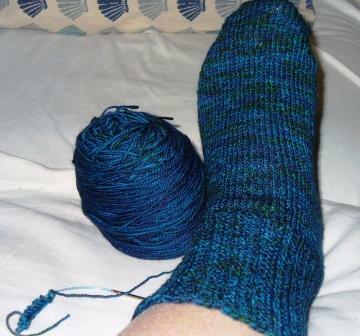 Sock update photo – one sock complete, the other cast on. I do love these FUNdamental socks, but I have to stop making them. How many pairs do I need? I promise, my next pair will be different. But I really love them. 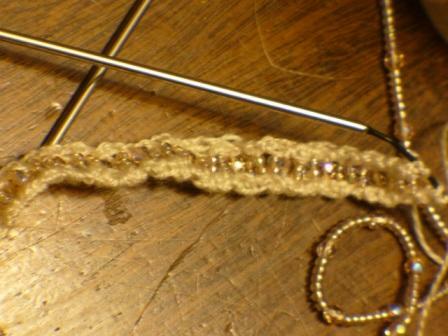 Then there is more jewelry knitting – this time it is Laura Nelkin’s Ribband. 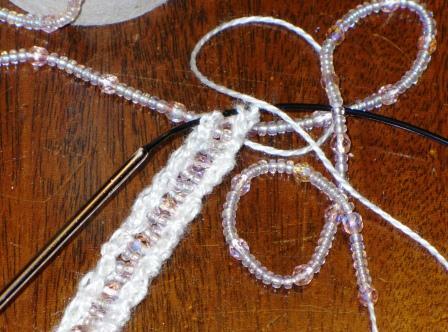 I can’t get the colors right – the silk is a very slight off white, the beads are pale pink cut glass and blush seed beads. It is pretty and if it is sunny Sunday (lol) I’ll take an outdoor photo. And it wouldn’t be my camera if it didn’t have a cat photo or two. This week, it was Tigger who was cute. 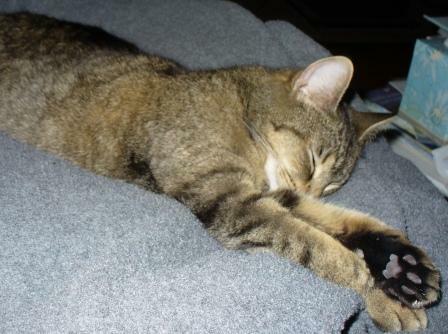 Here’s a picture of what happens when I pull a fleece blanket on my lap in preparation for knitting. Every night. And this is what happens every evening when A takes off her shoes. Tigger LOVES stinky feet, can you imagine? She is so ecstatic she falls over and rubs against them. 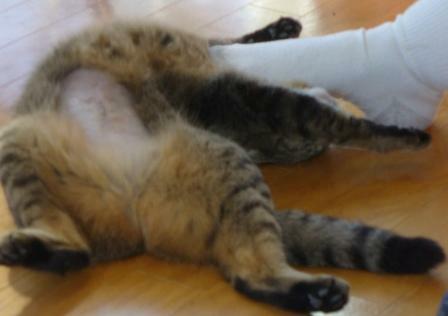 In this immodest and slightly blurry shot, you can see that her incision is all healed up. Her fur is just at the fuzzy stage of regrowth. She is glad it will soon get warmer, she definitely feels the chill. That’s all I shot this week! Looking forward to Saturday – second week of beading class, this time my niece B will join me as we learn (I hope) to make earrings. Author salpal1Posted on March 20, 2014 Categories how I plan to spend my day, how it came out, what I am making, what I am thinking about making, What I loveTags Bangor, beads, crafts, DIY, family, kittens, knit, WIP12 Comments on I cleaned off the camera again! I set the publish time of this post to 12:57 eastern time. Sure hope WordPress does this for me, it’s important. That is the time that spring arrives, and I want to be among the first to welcome her with open arms. I know she is nearby right now, because we are having a storm. It’s a deusy. Howling wind. Pouring rain. That is absolutely correct. It started out as snow this morning, but quickly changed to rain, and it has been raining hard for about 6 hours now. Oh, and I finished a sock. I’ll post photos at some point this weekend. Isn’t that exciting? lol. Took a few other important photos this week as well. Time to clean the camera again! Author salpal1Posted on March 20, 2014 March 20, 2014 Categories what I am thinking aboutTags hello, socks with Sarah, spring, winter8 Comments on SO glad to see you! Two days until Spring! I can’t wait. It is hard to believe that although it is 0 here to start the day (but may well climb to 30!) that spring is just a couple of days away. Also hard to believe that two years ago today, it was 70 degrees. Average high for this day in this area is 35. So two years ago, we were 35 degrees above average, this year we are 35 degrees below average. You can see how averages don’t really tell the story. However – the real reasons to celebrate? -I needed SUNGLASSES driving to work today. -We have more than TWELVE HOURS of daylight now (12 hours and three minutes, to be exact)! -Cold nights and warm days mean.. MAPLE SYRUP! I love maple syrup. is there anything better on vanilla ice cream? -One month from today, we will be heading south. Where, by the way, I expect to see flowers. Green stuff on ground and trees. NO MORE SNOW. I am bringing shorts, sandals, bathing suit and painting my toenails. So get cracking, Spring, it is your time to shine. Author salpal1Posted on March 18, 2014 Categories what I am thinking aboutTags celebrate, gratitiude, spring, weather report10 Comments on Reasons to celebrate! A rare winter Friday free from work obligations, aaaaaaahhhhhhh. So, today I am going to wait for the bug man to do his quarterly maintenance. He is usually nice and early, so I should be through with that soon. Then it is off to town to pay the property taxes, get the mail, go to the grocery store, you know the drill! 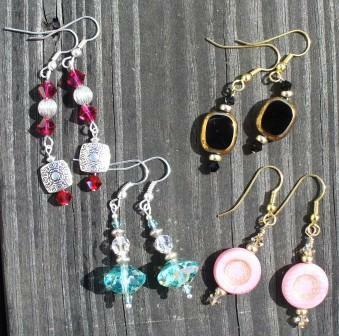 Home again to work on my shopping list for the bead store tomorrow. It won’t be as long a list as the last trip, just a few to fill in. Now that I have several necklaces done for the craft show next fall, I want to work on earrings and bracelets and other smaller items. At some point today I have to sweep snow out of the screened porch, and see if I can shovel the bedroom deck. Not sure I can, it is pretty solid ice. That’s it – just going to putter my day away. Yesterday was so “special”. Boss did NOT call back to cancel, he should have. Driving was frankly scary, the roads were coated with ice, and the wind was blowing all that granular snow around, making it hard to see. We did close early but really? Start late and close early – perhaps we should have just been closed? Not sure how much work got done in those 5 hours. Enough grumbling. I got home safely, as did A (she had to work all day) and we have a warm house. We are lucky, just so sick of winter. Today the sun is shining, sadly without heat, but still, it isn’t gray!